The Springbank 15 yr old is just great after a salmon dinner. Its sherry flavors with light smoke a just a delight. 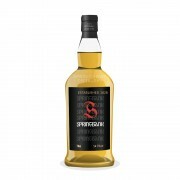 I haven't been a big fan of Springbank until recently when a friend gave me a dram of the 12 yr old Claret Wood. I bought some of it along with the 15 yr old. I have been converted! I would rate it an 88. Always been intrigued by the Springbank whiskies. Didn't find out about Claret in time. Gone from Oregon now. Bummer. It would have been up my alley. I'm thinking of the 12 year cask strength offering. On the fence right now. Thanks for your brief but intriguing review, Jim. You can get Claret Wood shipped to Oregon. I did try a Springbank 14 yr old Sherry Cask at cask strength but found it a bit overpowering for me. So, I am not sure about the 12 yr cask strength.